The Global Volcanism Program has no activity reports for Los Azufres. The Global Volcanism Program has no Weekly Reports available for Los Azufres. The Global Volcanism Program has no Bulletin Reports available for Los Azufres. The Los Azufres volcanic center is one of several silicic volcanic complexes with active geothermal systems that lie north of the axis of the Mexican Volcanic Belt. 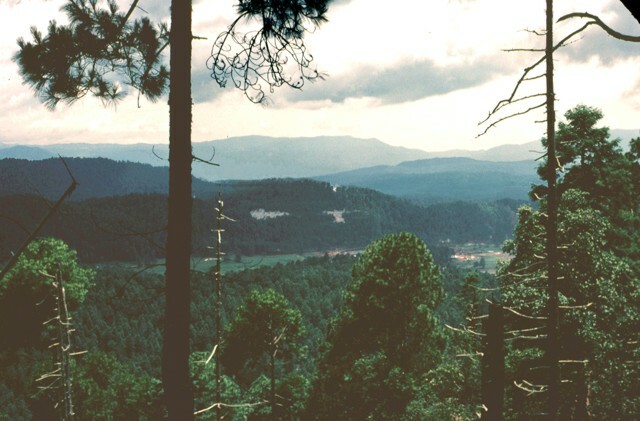 Located about 200 km NW of Mexico City, the Los Azufres center consists of a 18 x 20 km wide early Pleistocene caldera that was later partially filled by resurgent dacitic-to-rhyolitic lava domes. Two magmatic cycles lasting about 200,000 years each took place between 1.4 and 0.8 Ma (million years), consisting of silicic, followed by basaltic volcanism. The latest magmatic cycle, beginning about 0.6 Ma, involved resurgent doming of the southern part of the caldera, the eruption of chemically diverse basaltic-to-rhyolitic products, and the emplacement of dacitic-rhyolitic lava domes. The latest paroxysmal eruptions produced ignimbrites between 38,000 and 26,000 years ago. Hot springs and fumaroles are located along E-W-trending faults, and Los Azufres is an active producing geothermal field. Campos-Enriquez J O, Garduno-Monroy V H, 1995. Los Azufres silicic center (Mexico): inference of caldera structural elements from gravity, aeromagnetic, and geoelectric data. J. Volcanol. Geotherm. Res., 67:123-152. Dobson P F, Mahood G A, 1985. Volcanic stratigraphy of the Los Azufres geothermal area, Mexico. J. Volcanol. Geotherm. Res., 25: 273-287. Gonzalez-Partida E, Birkle P, Torres-Alvarado I S, 2000. Evolution of the hydrothermal system at Los Azufres, Mexico, based on petrologic, fluid inclusion and isotopic data. J. Volcanol. Geotherm. Res., 104: 277-296. Pradal E, Robin C, 1994. Long-lived magmatic phases at Los Azufres volcanic center, Mexico. J. Volcanol. Geotherm. Res., 63: 201-215. Segovia N, De la Cruz-Reyna S, Mena M, Ramos E, Monnin M, Seidel J L, 1989. Radon in soil anomaly observed at Los Azufres geothermal field, Michoacan; a possible precursor of the 1985 Mexico earthquake (Ms = 8.1). Nat Hazards, 1: 319-329. Torres-Rodriguez M A, Flores-Armenta M, 1998. Pressure and enthalpy evolution in wells of the Los Azufres geothermal field. Trans Geotherm Res Council, 22: 339-358. The Global Volcanism Program is not aware of any Holocene eruptions from Los Azufres. If this volcano has had large eruptions (VEI >= 4) prior to 10,000 years ago, information might be found on the Los Azufres page in the LaMEVE (Large Magnitude Explosive Volcanic Eruptions) database, a part of the Volcano Global Risk Identification and Analysis Project (VOGRIPA). There is no Deformation History data available for Los Azufres. There is no Emissions History data available for Los Azufres. The Global Volcanism Program has no photographs available for Los Azufres. Large Eruptions of Los Azufres Information about large Quaternary eruptions (VEI >= 4) is cataloged in the Large Magnitude Explosive Volcanic Eruptions (LaMEVE) database of the Volcano Global Risk Identification and Analysis Project (VOGRIPA).